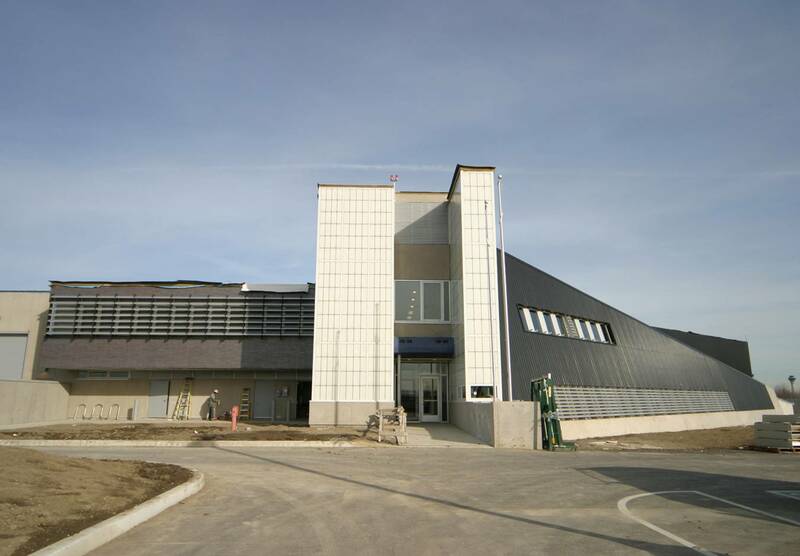 The Greater Toronto Airport Authority (GTAA) Fire and Emergency Services Training Institute is a 3 storey building located on the grounds of the Toronto Pearson International Airport. The 2,638 m2 building, completed in 2007, consists of a wing of six classrooms with cafeteria and ancillary support spaces, a central block of washroom and change areas with four adjacent vehicle bays and one storage bay. The GTAA Fire and Emergency Services Training Institute building is LEED Silver Certified and was selected for publication in the Justice Facilities Review by the American Institute of Architects (AIA). It has also been awarded a Canadian Institute for Steel Construction Award in the area of sustainability. Enthalpy recovery wheels on primary building ventilation air with average effectiveness 73% significantly reduce the outside air heating requirements. Walls have overall resistance ranging from RSI 4.6 to RSI 1.6. (MNECB RSI-value is 1.9). The green roof above the classrooms has a pre-vegetated flat panel system 50 mm thick on 150 mm thick expanded polystyrene insulation.The estimated thermal resistance of the green roof is RSI5.5. (MNECB RSI-value is 2.1). A natural gas fired boiler with 87% thermal efficiency heats water for space heating. Natural gas instantaneous water heaters produce domestic hot water with 82.3 % thermal efficiency. External solar shading devices are used outside windows facing south and west. The windows have thermally broken aluminum frames and double-glazing. Compact fluorescent fixtures are used in offices and occupancy controls are used in other spaces. Solarwall panels on south and west facing walls pre-heat outdoor air. Modeled annual savings: 30.9%, $16,222 (relative to MNECB).